The Little Magpie: Haar haar haar, except nobody's laughing. Haar haar haar, except nobody's laughing. Yes, another kimono. No, I'm not sorry. I've started putting bits together in my head that I want to take on holiday and this baby's one of them. I always struggle for daywear, so I think this'll be good to throw on to go to the beach/pool/etc etc. I think I'll also take these Minkpink slasher dopplegangers from Sheinside away from me, as long as I remember not to consume any coloured food or drink when I'm wearing them. There's no doubt in my mind that I WILL spill and I WILL ruin them. The lovely ladies at Glamorous were also kind enough to send over a beach box filled with summer party essentials like cups, sweets and a little cropped jumper for when it gets cold. I ended up having a bbq that night so the box came in pretty handy, so thanks again for that amigos! It was amazing weather this morning so me and Rob went out for a walk along the harbour, that is until the haar crept in and ruined it all. Honestly, it was like being in a school disco with all that fog surrounding us - all we needed was a cheap disco ball and the setting would be complete. You can see it creeping in at the left of that second last photo, which must have been taken just before I got completely enveloped. WAH, this is possibly my favourite kimono of yours. Love the colours! 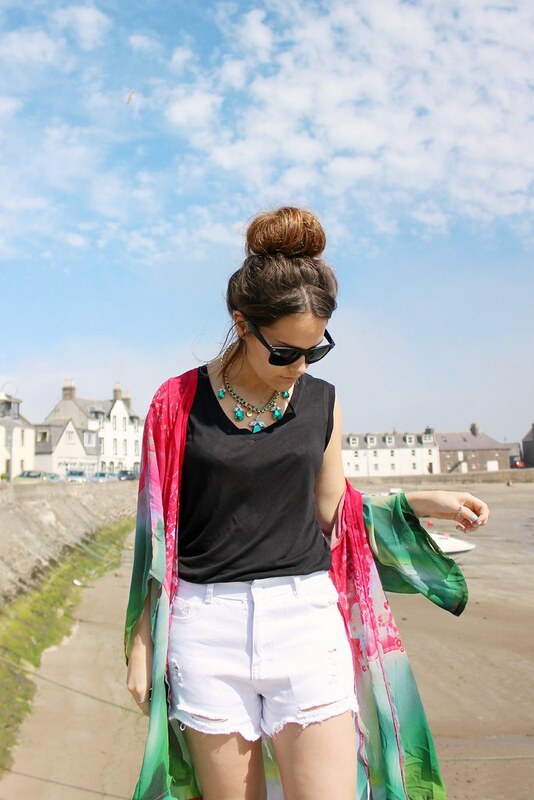 love your bun and your kimono! Aw your posts lately have made me desperate for a kimono and this one is so pretty! 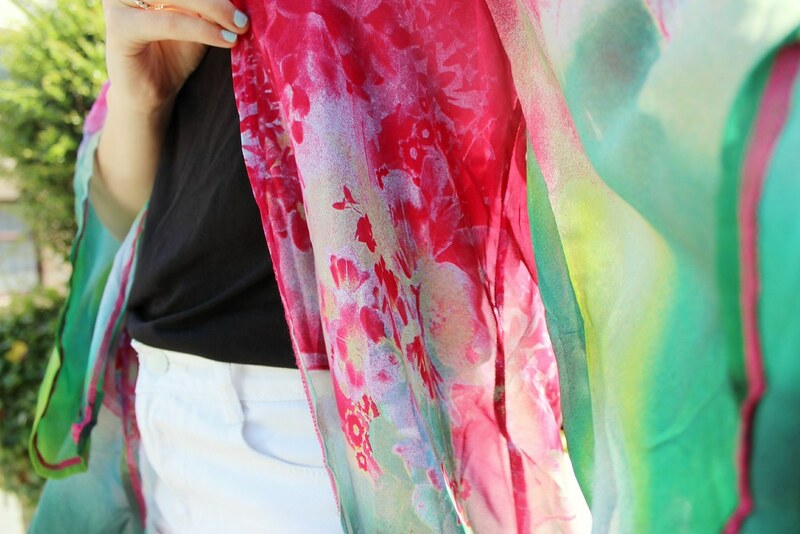 Love the colours of this kimono! You need to have words with that sea fog! Getting all up in your grill and making visibility poor, it's just not on. BAD FOG. That kimono looks wondrous! Love the colours! This is my favourite kimono of yours for sure, the colours are gorgeous! What's a haar? I feel silly. GIMME YA OUTFITS. Love these white shorts, although I too am a spiller (goovjet) and will no doubt ruin them.